Opened in 1910, the theatre was originally named The Globe, after Shakespeare's theatre in England. The theatre had a retractable roof to enable the theatre to stay cool and open during the summer. For nearly two decades, the theatre housed a variety of plays and musicals until 1932 when it was turned into a movie house. In 1958, the theatre was gutted and rebuilt in its present configuration as a legitimate theatre. It was renamed in honor of America's foremost husband/wife acting couple, Alfred Lunt and Lynn Fontanne, who starred in its first production, The Visit. Theatregoers can enjoy a selection of photographs from their private collection on display throughout the lobby areas. 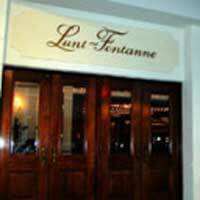 The Lunt-Fontanne has 1,505 seats and is one of The Nederlander Organization's nine Broadway theatres.